The relationship of risk and return is a core concept to any investment decision. Nearly every investment (apart from keeping money under your mattress) is designed to produce an expected return - typically through income, capital appreciation , or some combination. However, the basic principle of the risk-return tradeoff is that higher potential returns generally require a higher degree of risk. 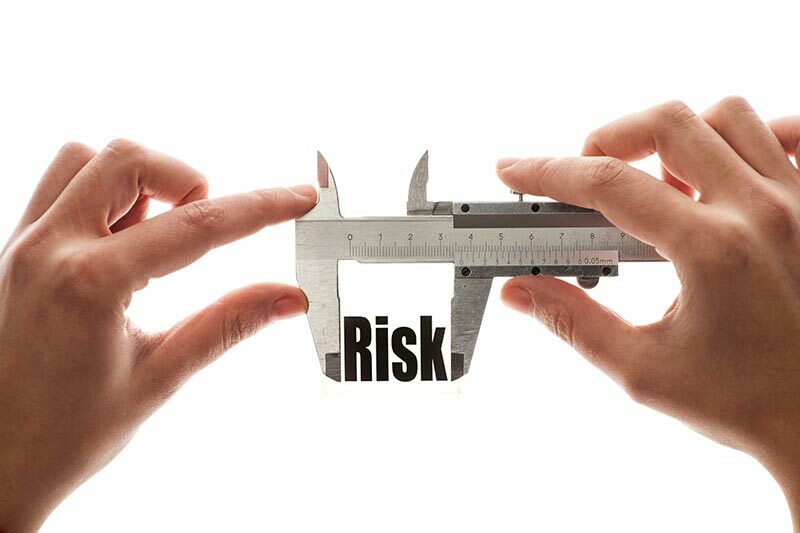 Exactly how much risk an investor is willing to take is an individual decision based on a wide variety of personal factors including (but not limited to) their current overall investment portfolio composition, timing of when invested funds may be needed, timing to retirement and income potential from other sources. *This graph shows the risk profiles of real estate, not private securities. Private securities as an asset class are risky, with a loss of capital as a possible outcome. Core properties exhibit the lowest risk and lowest potential return. These properties are the most conservative of the four risk profiles, providing investors with more predictable returns. Core properties may exhibit stabilized occupancy , credit tenants , longer lease terms and/or prime locations. They also generally require little to no immediate capital improvements. Core properties generally have plentiful financing options available (assuming a satisfactory borrower) and may provide a relatively high level of income security but little opportunity to increase yields in the near-term. This risk profile generally produces low to moderate capital appreciation in the short-term and the expected holding period is often longer term (10+ years). 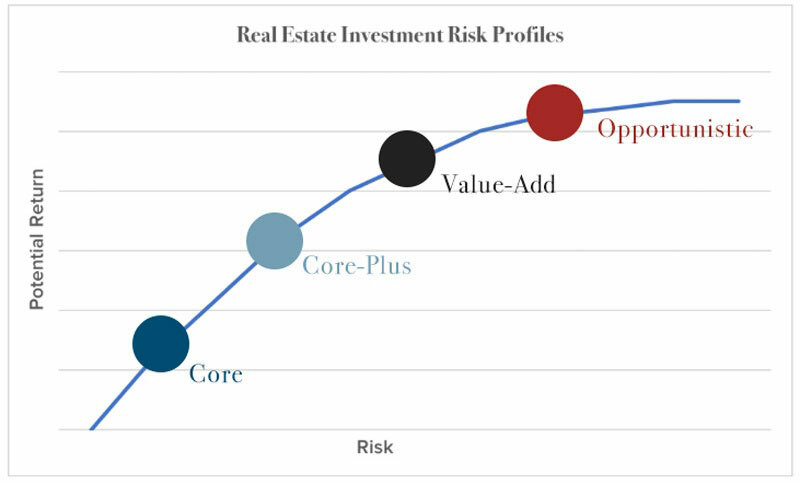 Core-Plus properties are similar to core properties, but have slightly higher risk and higher potential return. This marginally elevated risk may come from the potential to increase net operating income (NOI) via an upcoming lease expiration or filling a relatively small level of vacancy. Core-Plus properties generally require a low degree of capital improvement and are considered a relatively conservative investment with moderate to low risk. Core-plus properties may have a lower in-place yield compared to core properties but offer the ability to modestly increase yields in the short to medium term, resulting in moderate appreciation. Like core properties, under normal market conditions, financing is widely available for these assets and expected holding periods are typically medium to longer term (seven to 10 years). Value-Add properties exhibit medium- to high-risk and medium to high expected return . These investments generally provide the opportunity for improvement (to add value), either physically or operationally. Value-add properties may be experiencing below market levels of occupancy and/or rental rates or may require substantial capital improvements in order to attract and retain tenants. Value-add properties may have higher growth and capital appreciation potential but lower near term income security compared to core and core-plus investments. Financing may be less prevalent due to the higher risk profile and such investments may incur higher interest rates and shorter loan terms due to the risks involved. Holding periods are generally short to medium term (three to seven years). Opportunistic properties exhibit the highest risk and highest potential return. These properties are often classified by their need for substantial enhancement to generate return. Examples may include ground-up developments, adaptive re-use, complex legal situations such as bankruptcy or foreclosure, or investment in “niche” property types or emerging markets. Opportunistic investments may exhibit low or even negative initial yields and/or require significant capital investment over the holding period. Total returns for this risk profile have the potential to be outsized, but may be heavily skewed to the back end of a deal. The availability of financing for an opportunistic investment is often highly dependent upon the business plan for the asset and the operator’s track record. Holding periods are generally short term (one to five years). Prior to making real estate investments, individuals should consider their own personal risk profile including tolerance for, and ability to take a loss, desired investment period and amount of time and effort they are willing to contribute to a property or investment. Visit our Marketplace to view a variety of 1031-qualified real estate investment opportunities. The majority of these offerings can be classified within the “Core” and “Core-Plus” risk profiles.